Most rubber car mats are designed with deep ridging to help capture a range of debris, such as food, mud, stones, and other unwanted substances that could otherwise stain your vehicle’s carpet. Though replacing a stained car mat is reasonably inexpensive, there’s little point in throwing away a mat that is otherwise perfectly fine. In most cases, you can shake off your rubber car mats every now and then to remove unwanted debris and water from your vehicle, but on the occasion that you’ve spilled something more sinister on them, you might need to put in a little more elbow grease to restore their cleanliness. If you’re dealing with tough, ground-in stains on your rubber car mats, then you should read ahead. We’ve put together a quick 4-step guide to show you how best to remove a bad stain from your mats. Before you can get to the stains problem, you’ll want to carefully remove your rubber car mats from the foot wells of your car or truck and shake them outside of the vehicle. This will remove any non-stuck stones, food, or other debris. Providing the dirt has dried out, you might also be able to lose a lot of the ground-in stains by flexing and slapping your mats, as this will typically crack and break away mud, for example; the non-stick properties of rubber are excellent. If you’re still left with the suspected stains on your mats, then you will want to progress onto Step 2. Whether you’re left with a chemical stain or something more natural such as dirt, you should now rinse your mat with water from the tap, as well as trying to blast the stains with a high-pressure hose. However, don’t use too high a pressure to avoid damaging your mats. This step may be strong enough to blast away some of the stains, depending on what they are. However, if you’re still left with a problem area, you can move onto Step 3. This is where you stand the best chance of removing any stains that have not been loosened or removed by rinsing or spraying with a hose. You’re going to need a cleaning product that is optimized for use on automotive materials or rubber specifically, as well as a wire brush; you could use the same brush used for your tires. Using warm water and a generous amount of your cleaning product, focus scrubbing in a circular motion on the affected area. Any ground-in dirt should soon come away from the rubber, or greasy chemical stains should begin to wash away leaving no residue. One thing that you should never do is leave your mats to dry directly in sunlight. This can bleach out the colors leading to fading, or could cause cracks to appear. Instead, place them in a cool, shaded area, or rub them down gently using a chamois leather or microfiber towel. 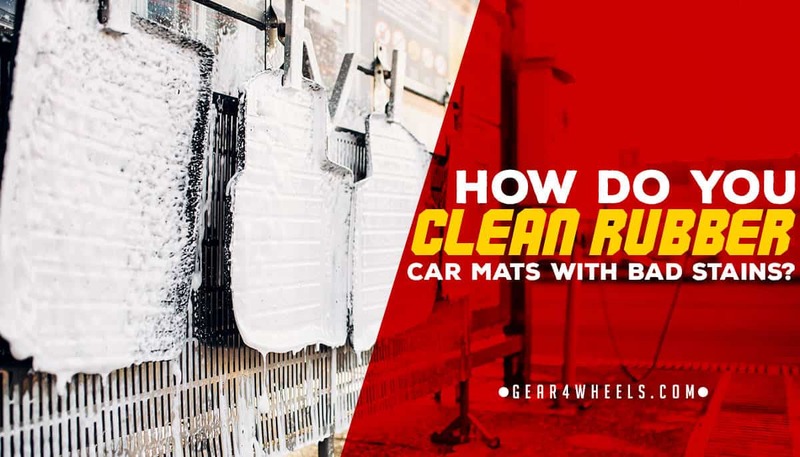 Never place rubber mats back in the car until they are completely dry; the seal formed between the mats and the vehicle carpets could result in the development of mold spores. If you’re faceing loose dirt or debris, then you can simply shake it out of your car mats by removing them from the vehicle. However, if you’re dealing with tougher stains, then you may need to try scrubbing them with a bristled brush and light automotive cleaning product. It’s rare that you’ll need to entirely replace a rubber car mat as a direct result of staining, but if you do, they are at least relatively inexpensive.